You Are Sincerely Welcome to Join With USMAF..!! There’s never been a better time to SHARE THE TRADITION..!! As a USMAF member for many years, I can tell you there has never been a better time to refer your students and colleagues to United States Martial Arts Federation. - Established the National Programs to promote Martial Arts and more coming..!! - Partnered with other National & International Organizations to include; United States Ju-Jitsu Federation (USJJF), USA Traditional Kodokan Judo (USA-TKJ), USA Karate Federation (USAKF), Central Taekwondo Association (CTA-USA), USA Aikido Association (USAAA), International Kwanmukan (KMK), Panamerican Judo Union (PJU), World Judo Federation (WJJF) and the Martial Arts International Federation (MAIF). - Created and manages the Kiai Budo Shop (www.kiaibudoshop.com) providing organization merchandise, uniforms, patches and training equipment at considerable discounts for Our Members. "Share the Tradition". Pass The Word..!! Members sharing their own experiences by word-of-mouth throughout the USA Martial Arts Community is a time-honored tradition of USMAF. 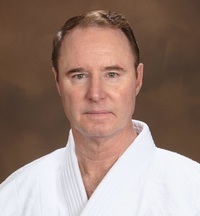 Simply pass on the USMAF Website: www.usmaf.org next time someone asks who You Trust for Providing Services to Judoka and Leading the Way in the Further Development of Martial Arts and the Sport For All World Games across the USA and the Globe. Thank You for every effort you make to tell others about USMAF. By spreading the word about USMAF Membership, you help strengthen our federation and the services to you..! !